After the Great Icefall, the Muldrow glacier technically ends in a large bowl below a massive jumble of ice- the Harper Icefall looks like a giant alligator waiting to eat you. Fortunately the mountain provides gorgeous detour around this feature by following Karstens Ridge for approximately 3,000 vertical feet just east o the Icefall. This ridge is arguably the most beautiful and engaging climbing of the route. June 23 we carried most of our food and fuel to the base of the ridge at 10,800′ and scoped a plan to get on the actual ridge (one of the hardest parts). June 24 we packed up camp in good weather, gained the ridge, and built a new snow camp at 12,100′, passing our cache below us. We knew there was some hazard in leaving an avalanche slope between us and our cache at 10,800′ but we wanted to take advantage of good weather, and felt like the short gap between us would be doable in most conditions. The 12,100′ camp is likely the most beautiful place I have ever camped, and offered views above most of the surrounding peaks. As might be expected, June 25 saw us hunker down for our first weather day (hard blowing snow and low visibility) loading the avy slope between us and most of our food. We had enough to wait two days, but I wasn’t impressed with my response to the first real threat of food stress. We decided to scope out conditions on June 26, and spent a long 11 hours very carefully mitigating avy hazards to get our cache up to the ridge camp that evening. Also at 12,100′ we caught up to a large team from NOLS, and a 3 person team from Massachusetts both whom had left about a week before us. It seemed a little funny to have 3 teams on a remote wilderness route all stuffed into a small ridgetop camp, but it was fun to share the experience with new faces. NOLS had already broken a trail up the ridge for us, so June 27 we moved a cache to 13,600′ on the ridge and returned to camp. The terrain on the ridge was steep and exposed, normally this wouldn’t have been a problem but with a huge pack I felt unsure of myself. That night we met a fourth team at 12,100′- two Russians that had started two days after us and were moving quite fast, and something triggered our suspicions. June 28 we broke camp and moved up to Browne Tower, a huge granite feature at the top of Karstens Ridge, along with all of the others teams. Campsite space here is limited and building camp was extremely laborious- NOLS got out of camp first and grabbed the best spots for their huge crew. I went to bed worked, but excited to be high on the route at 14,600′. June 29 we took it easy and retrieved our cache from 13,600′ and absorbed being truly above the clouds within direct sight of both Denali summits. 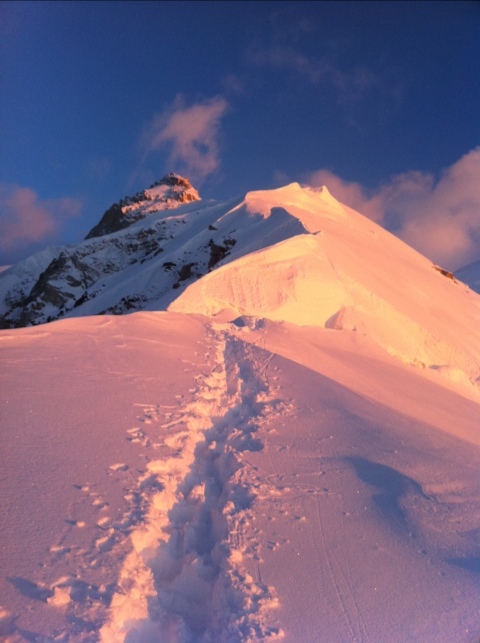 This entry was posted in Alpine Climbing on July 14, 2011 by sticker1. 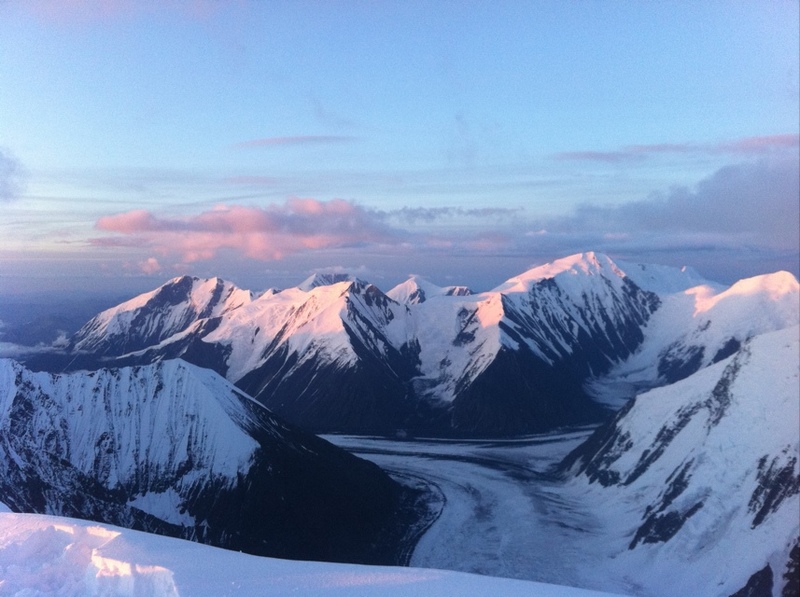 Come on – Really, NOLS took the best spots? I thought Masste-chodes took the only flat location with there cache and on-night igloo and NOLS dug into the side hill and offered the NPS a spot that they had already probed? Fair is fair, but if you all had probed it I was not aware of that information. FWIW, I thought you all had the best spot- way more protected in the rocks. Thanks for following, and keep in touch! Hi Skander – Great trip report. Congratulations on the traverse. I am writing to see if you could provide me with some additional information on the access to Karsten’s Ridge. You mention negotiating 70 degree slopes on a fixed line due to avalanche conditions on less steep slopes. I have read a lot of trip reports over the years on the Muldrow, but have never heard of any group having to take on 70 degree slopes to access Karsten’s Ridge. Most groups report 40-45 degree slopes max. Can you provide me with any additional information on the specific location you accessed the ridge and the choice to tackle the steeper slopes? I have tentative plans to attempt this same traverse in 2013 and don’t relish the idea of having to take on 70 degree slopes with heavy packs and sleds. Incidentally, how did you get the sleds up in these areas? Multiple carries?